Bassmaster Classic champ Mike Iaconelli, co-founder of Bass University recently gave the Flying Lure unsolicited praise in his book on finesse fishing. Bass Fishing Hall of Fame writer Steve Price of BassMaster Magazine recently wrote a book, to be published soon, in which he documents the whole Flying Lure phenomenon. Glen Lau, the legendary filmmaker who produced the seminal bass fishing film “Bigmouth”, featuring legendary writer and angler, Homer Circle and narrated by The Twilight Zone TV show's creator Rod Serling, himself, talks about the Flying Lure in his latest book about his life in fishing. All the original supporters of the Flying Lure are still using it – the Hibdons, Guido and Dion, the only living father and son duo who are both Bassmaster Classic Champions. Guido Hibdon once said on camera “When they told me there was a guy with a lure that backed up, I thought I was going to meet some idiot.”. Needless to say, Alex Langer was very, very glad he changed his mind. 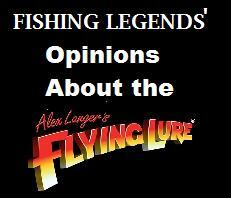 And maybe the biggest Flying Lure believer of all-time and its most proficient user, Don Meissner , of PBS fame, called Alex Langer the other day. He excitedly told Alex that he had just been fishing in upstate New York with a group of notable people and the Flying Lure was the only thing actually catching fish. Don is currently shooting a brand new TV fishing show on PBS that focuses on stories of our troops coming home from the Middle-East. Don always said, before anyone else even discovered it, “When nothing else is working, the Flying Lure is the one lure I can count on.” Alex is very happy that’s still true. Homer Circle, the late great outdoor writer, longtime Angling Editor of Sports Afield Magazine and most recently an honored contributor to Bassmaster Magazine, once wrote, "Alex Langer is the future thunder-maker, himself". It’s important to remember who saw the Flying Lure’s promise early in the game. Here’s a press release we sent out right after the 1991 national show. Four writers were way ahead of the pack. They were our friends when we had none. They were the visionaries who saw what was possible. Outdoor writers nationwide are calling Flying Lure the most exciting new product announced at the 1990-season American Fishing Tackle Manufacturers Show/Outdoor Marketplace held this July in Las Vegas. AFTMA is the largest international fishing & outdoor sporting goods exposition in the United States held every year to display sporting goods to the trade and the press. "My pick for number one angler eye opener...at this year's AFTMA show is Flying Lures." "I asked four writers In the press room at AFTMA what the best new product at the show was. They all said I had to see Flying Lures." 'Every year I try to spot products that have the chance of making it big...". First on O'Malley's list: Flying Lures. "Flying Lures will be around for a long lime."